(From left) Assoc. Prof. Dr Yip Mum Wai, Associate Professor of FOET, Dr Lim Yee Mei, Associate Dean of FOCS, Dr Tan Hui Yin, Deputy Dean of FOAS, Assoc. Prof. Say Sok Kwan, Vice President of TAR UC, Assoc. Prof. Dr Lee Wah Pheng, Head of the Centre For Postgraduate Studies and Research ('CPSR'), Ms. Lim Mei Shyan, Dean of FOCS, Assoc. Prof. Dr Ng Swee Chin, Datuk Dr Tan Chik Heok, Nik Naharudin Mohd Nasir, Dato' Yap Kuak Fong, Tan Sri Dato' Sri Barry Goh, and Dato' Chan Wah Kiang, posing for a group photograph at the I2 Hub launching ceremony. Located within the Kuala Lumpur Main Campus premises, the hub will serve as a centre of intelligence harnessed from all the faculties within TAR UC and turns it into a catalyst for the creation of innovative applications and technologies aimed at four key areas, namely Smart Campus for Education 4.0, Industry 4.0, Agriculture 4.0 and Corporate Social Responsibility ('CSR') services. 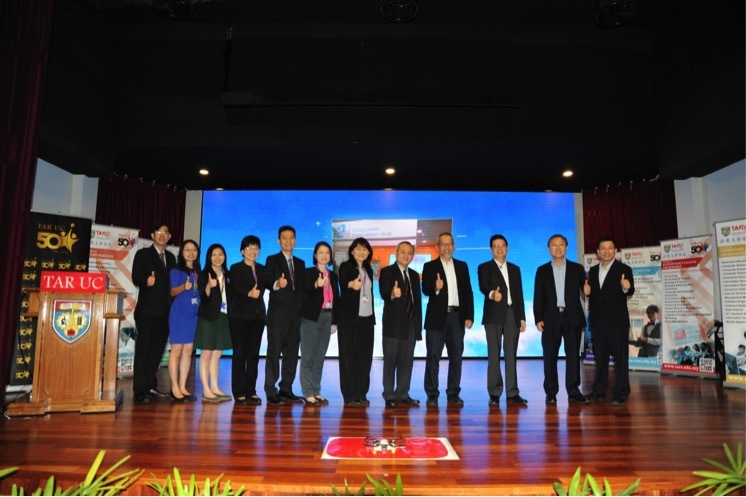 With I2 Hub, TAR UC has been conferred the honour of being the first institution of higher learning in Malaysia to embark on developing and incorporating digital technology to turn TAR UC into Smart Campus through in-house development, and the first institution of higher learning in Malaysia to provide consultancy to the industry in the implementation of the real-time Industry 4.0 solutions. "The I2 Hub will be where our brightest minds spark to produce innovations and technologies that will solve real-world problems,” said Assoc. Prof. Dr Ng Swee Chin, Vice President of TAR UC and Chairperson of the TAR UC Integrated Innovative Projects in her speech. "I truly believe that the TAR UC I2 Hub will deliver positive impact to the nation, industry and society through its four value propositions, namely Synergize Learning, Converge Innovation, Create Knowledge and Serve Community," said Datuk Dr Tan Chik Heok, former President of TAR UC. The launch of the TAR UC I2 Hub was witnessed by Nik Naharudin Mohd Nasir, Head of IHL Development, Malaysia Digital Economy Corporation ('MDEC'), Dato' Yap Kuak Fong, Member of the Board of Governors of TAR UC and President of TARCian Alumni Association ('TAA'), Tan Sri Dato' Sri Barry Goh, TAA Honorary Advisor, and Dato' Chan Wah Kiang, Deputy President of TAA. Assoc Prof Dr Ng Swee Chin giving a brief explanation on the functions of the newly launched I2 Hub.